“Through his Twitter account, the Congressman has catapulted to a cultish delightfully nerdy social media stardom. Post-election, Lieu has made multiple appearances on cable television, including MSNBC and Real Time with Bill Maher. If you’re a politics junkie who likes to follow Congresspeople on Twitter — or even if you aren’t, even if just really, really hate Donald Trump — you’ve probably liked a Lieu tweet without realizing it. Lieu gives the platform credit for lending him access to voters he wouldn’t normally be able to reach. I’ve blogged about my favorite Taiwanese American Congressman, Ted Lieu. I’ve never watched The Jim Jefferies Show on Comedy Show, but I saw this interview with Congressman Lieu I think on Facebook. The last time I saw Congressman Lieu on TV I think was on 60 Minutes. In conversation, Lieu is far more cautious and earnest than he is in his Twitter ripostes, and polite to a fault. Born in Taiwan, he projects a conservatism in manner and dress that seems at odds with many of his constituents. After a dozen years serving in local and state politics, he succeeded Democrat Henry Waxman, who retired in 2014 after representing California’s 33rd District for four decades, more than three-quarters of Lieu’s life. The district is among the nation’s wealthiest and includes Beverly Hills, Santa Monica, Malibu and Lieu’s more middle-class home of Torrance. I love following Congressman Lieu and do wonder if his tweets are to give himself a higher profile. This past July, I did see Lieu speak at Politicon 2017 in Pasadena, and was able to ask him if he was going to run for Senate if California Senator Dianne Feinstein was going to retire (she’s 84 and her current term expires in 2018) – he stated he was focused on getting re-elected and helping elect a Democratic House for 2018 (note: Feinstein has since stated she’s going to run for re-election). Make you kind of think who is listening to you on your phone or watching you via your phone’s camera … pretty scary. Ted Lieu is currently a California State Assembly member in the California state legislature and he is running for Congress. Full disclosure: I think I have donated to to his campaign in the past, and have met him a few times. 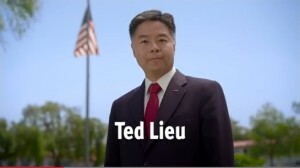 Ted Lieu is an accomplished representative, military veteran, long-time resident of the district and the official candidate of the Democratic Party for Congress in California’s 33rd District. I’m always ecstatic to see more and more Asian Americans running for higher and higher offices and hope that all of you consider voting for Lieu if you live in the 33rd California Congressional District. All three had previously voted to move SCA5 along.